Now, I'm happy to admit I'm pale, very very very pale, so pale that most people actually say to me "Wow! You are so pale! Why are you so pale?". And, as much as I'm cool with it during those Autumn and Winter months, I start to feel like I would like a touch of tan to make me look, well, healthier during those warmer seasons. So now it's what, July already? I've already used the Solait Tinted Bronzing Foam in Light/Medium (as mentioned in my blog post here), but now I'm starting to realise that that stuff is an absolute nightmare for me to spread evenly! So I've ruled out foam tan, and I've tried and failed with spray tan a few years ago...so now it's time to bring out the big guns: gradual tanning lotion. 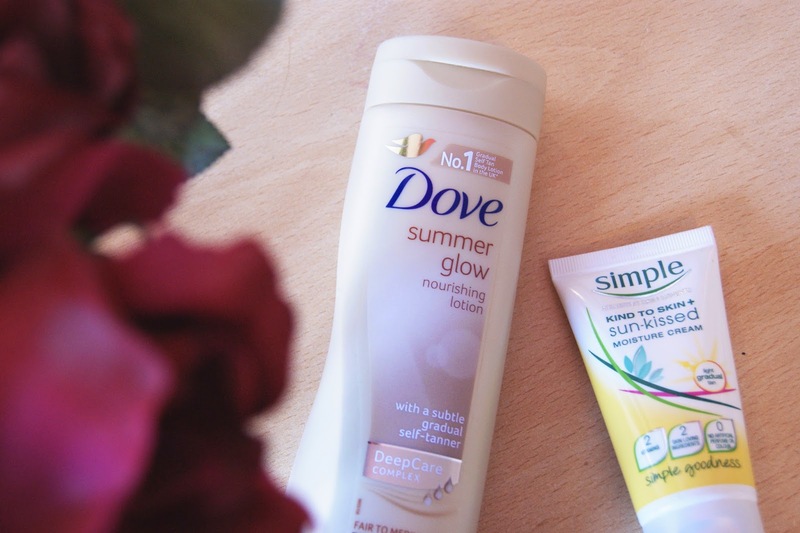 I have heard so many positive reviews about the Dove Summer Glow Nourishing Lotion...that it is so moisturising and gives you a great, natural looking tan, but I was always put off by the idea of having to put it on every day. Now, I'm so lazy when it comes to routines, but for some reason I've been actually sticking to this for about five days now...and boy am I gettin' bronzed! It's such a natural, yet noticable, tint that really makes me look super cool and super healthy during this humid summer in England - and I love how it absorbs so fast so I can just slap it on after a bath and I'm on my way! So I use the Dove lotion for my body...meaning that I need something to use on my face so it all matches and looks fab. I've used this moisturising cream for well over a year now, and it's my all-time favourite that everybody needs to purchase...it's my baby, the Simple Kind-to-Skin Sun-Kissed Moisture Cream. This is the Queen of all moisturisers - it's soft, nourishing, and soaks quickly into the skin. I apply it before my concealer, and it makes my skin look so dewy and fresh! And, to add even more to this perfect product, it's slightly tinted, meaning that you get a gradual facial tan that 'enhances your skin's colour'. So amazing, so perfect. Go buy, that's all I have to say. All you pale people out there, what do you use to tan...or do you leave your natural complexion tan-free?